disclaimer: I was the National Wine Centre‘s guest at this dinner. If you follow the Eating Adelaide calendar (and the sporadic Friday posts on Facebook) you’ll know that throughout the year, the National Wine Centre (NWC) has been hosting a series of wine dinners. In my pre-baby life, I would have been all over attending events like this but those kind of activities have slowed down somewhat in the last almost 4 years, so while I’ve been able to tell you about them happening, there have been no first hand accounts. 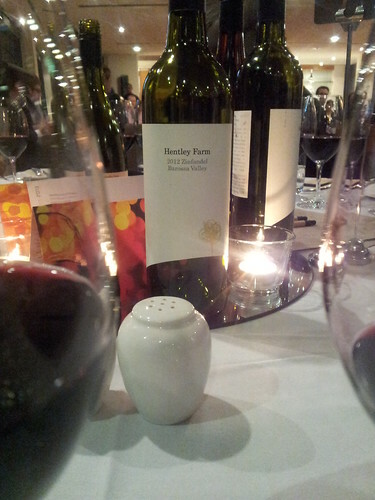 Luckily for me, the National Wine Centre extended an invitation to attend the Hentley Farm dinner. I was thrilled that I was able to accept (thank you, Andy, for not only taking on baby sitting duties but also dealing with the flat battery due to some idiot leaving the car’s lights on) but also very interested because Hentley Farm is a winery that has a good reputation (both for its wines and its cellar door restaurant). It’s somewhat remiss of me not to be familiar with their wines so this was an opportunity to fix that. So I spent a good month looking forward to this meal, and finally headed along to the centre’s Vines dining room, feeling a bit self conscious that I’d be walking into the event solo but figuring that I would at least recognise Lucy from the NWC. The evening started with mingling, the Hentley Farm Riesling (the only wine for which grapes are not sourced from Hentley Farm’s Barossa estate) and delicious kingfish canapés, served with finely shaved radish, kohlrabi and fennel and finished with a Meyer lemon purée. These worked really well with the vegetables providing texture and layers of flavour and the lemon purée finishing off the morsel cleanly with a tasty citrus zip. It came time to sit down and I headed off to my table, and sat down next to a couple. I turned to introduce myself to the woman next to me. “Hi, I’m …” I started, only to have my sentence finished. Yes, only in Adelaide can you head along to a dinner and randomly sit next to someone you went to school with and haven’t seen in the last n years! Katie now works for the design company which does lots of work with the NWC, but since leaving school she’s done a couple of degrees, worked in the US and done the family thing. So there was a reasonable amount to catch up on. Also at the table was Andrew Quinn and Keith Hentschke, Hentley Farm’s winemaker and owner respectively, as well as some NWC staff and guests. Both Keith and Andrew spoke between courses to introduce the wines and Hentley Farm story. I thought that they struck the balance between being informative and entertaining really well and I loved that they chose not to use the lectern but wander around the room a little (something that only works if you’re confident and can project your voice!). It made their talks feel more like chats and I think it definitely encouraged questions. 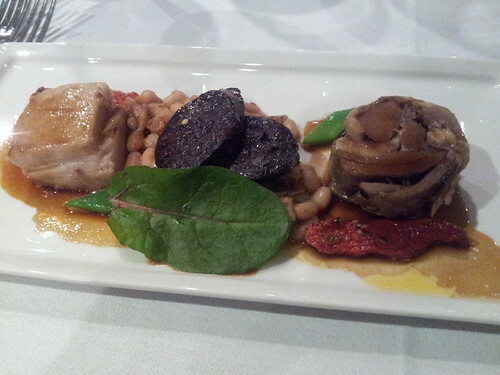 First course was a trio of entrées: belly pork, duck confit and black sausage, served with haricot beans. While I really liked the concept of this dish, I thought that the black sausage was a little bit lacklustre. My time in England was spent eating a lot of full English breakfasts and forming some very strong opinions on black pudding and I’m yet to find one in Adelaide that cuts the mustard. Which is a shame because pork belly and black pudding is one of those really classic combinations. The entrée was served with the 2012 “The Stray Mongrel” (a Grenache Shiraz Zinfandel blend) and the 2012 Zinfandel. My pick of these two wines (both in terms of the wine and the wine and food match) was the straight Zin. In particular I thought it worked really well with the anise flavours in the duck. Next up was, what was for me, the star dish of the dinner. 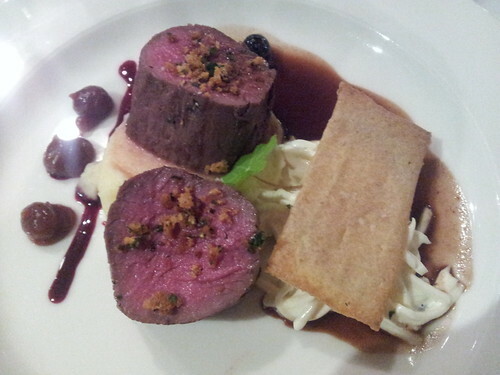 Venison loin, served with chestnut and celeriac, date compôte and pickled blueberries. I love venison and celeriac but have to admit I was a bit nervous about the date compôte. I’m a bit funny about fruit in savoury things – especially something that might be so obviously sweet as dates. But my goodness – it worked really well and next time I am cooking something gamey (probably relatively soon, as I have some pheasants coming my way) I’ll definitely be experimenting. I was also really impressed that the venison was served beautifully pink. Well done to the kitchen. Too often meat served at functions will be overcooked and dried out – something that is both easier to do and avoids any complaints from the well done brigade. Congratulations to the kitchen at the NWC. This course was paired with 2011 The Beauty and 2010 The Beast. Both Shirazes but wines that receive very different treatment. The Beauty is 3% Viognier (cofermented) and sees 40% new French oak, whereas The Beast is 100% Shiraz and sees 80% new oak. Now, based on those descriptions alone, I would probably choose The Beauty as my pick, but on the evening, The Beast really stood out as the stand out wine (of the dinner) for me. The final course saw the 2010 Clos Otto Shiraz served with Ossau-Iraty: a French sheep’s milk cheese (which also happens to be one of my favourite cheeses). 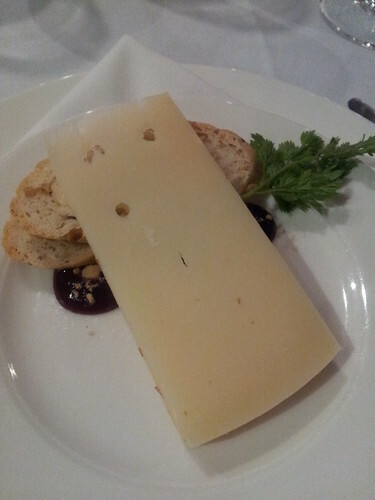 The cheese came with some hazelnut baguette and black cherry jelly. While the baguette was neither here nor there for me, the black cherry jelly was excellent (served with some crushed hazelnuts on top) and a really clever change from serving quince paste. The meal wrapped up with door prizes, some wine specials if you wanted to buy wines and, naturally, coffee and chocoMe chocolates. I think it’s obvious that I had a great time: some of my favourite things to eat were served, along with some very classy wines. The real litmus test with events like this is – would I spend my own money? And unreservedly, I can say I would. The dinners are usually around $100-$120 a head and they are set menus, so if you are a picky eater they might not work for you. But if you like food and wine you should have a ball. The next dinner is on Wednesday 17 July and it will feature wines of the Hunter Valley. More details are available on the National Wine Centre site. The dinners do usually sell out so if you are interested in heading to one – don’t dawdle!